A popular attraction at the Dickens Christmas Fair, the Brassworks Band, founded by drummer Dave Miles and trumpeter Franklin Davis, plays six times a year for Ye Gaskells Victorian Balls in Oakland's magnificent Scottish Rite Ballroom. 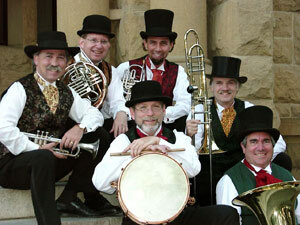 The Band plays for period dance events all over Northern California, including the National Civil War Association's annual Grand Ball, Stanford University's Viennese Ball and Vintage Dance Week, and various other living history events. The Brassworks Band consists of the versatile Brassworks Quintet and our multi-talented Drummer, making it an ideal - and affordable - "Little Big Band" for dance parties and wedding receptions. The Band's repertoire includes Dixieland standards, classics from Glenn Miller, Duke Ellington and the Swing era, Motown, Rock & Roll, Waltzes & Polkas, Rhumbas, Sambas and Tangos, and traditional Oktoberfest music. The Brassworks Band features an ever-growing catalog of 19th and 20th century ballroom music from Europe, Russia, the British Isles and America. We re-create authentic dance tunes and steps from the Civil War Era and from early California as well. Float around the ballroom to romantic Strauss Waltzes. Kick up your heels to Quicksteps, Schottisches, Gallops, Grand Marches, Rounds, lively Polkas, Mazurkas and Quadrilles, and an exciting Can-Can. Our Dance Master can be engaged to teach and to call all of the authentic steps. Book The Brassworks Band now for your event!